Sigma has expanded their ever growing Global Vision line with the world's first constant f/2 aperture on a full-frame zoom lens, the 24-35mm f/2 DG HSM Art Lens, available here with the Canon EF lens mount. The groundbreaking aperture combined with the versatile wide-angle 24-35mm focal length allows photographers to easily replace three common lenses, the 24mm, 28mm, and 35mm, with one piece of gear. The lens also offers exceptional control over depth-of-field with an aperture range from f/2 to 16, and when used on APS-C camera bodies it has an equivalent focal length of 38.4-56. 24-35mm f/2 DG HSM Art Lens for Canon EF is rated 4.5 out of 5 by 27. Rated 5 out of 5 by Anonymous from 3 primes in 1! Although a bit too heavy and too small of a range to be considered a walk-around lens, I love carrying this around in my kit for shoots. It essentially replaces 3 primes: a 24, 28, and 35, though I end up using mostly just the extremes of 24 and 35. If you feel that you don't need the extra stop at 1.4, I would recommend this lens over getting a 24 1.4 or a 28 1.8, but not the 35 1.4. This lens performs amazing as all the Art series lenses do, having extremely sharp images wide open at f/2. However, the vignetting is severe unless you stop it down, but that can easily be fixed with some post processing. Rated 5 out of 5 by daniel from Superb lens I have used it for the first time for the past three days for a shoot, and I am very pleased by the crispness and definition of this lens. I have only two issues: one it is very big and very heavy. I haven't taken it outdoors since my body is already heavy (1DsMkIII) and I think I won't take it on the road very often. But as a studio lens, it is perfect. Second issue is some fringing, but nothing PS can't take care off. Also, I'll have to either find its profile online or create one myself. I haven't used it enough to have noticed any other concerns but my first impression is very very good. Rated 5 out of 5 by Brandon B from The Bridge Between Primes. For weeks and weeks I was daunted by the task of finding that one lens that seemed to be mythical. I juggled around the idea of two primes, but the idea of adding more weight and items to an already cramped camera bag was very offsetting. A few days before purchasing, I was deciding between the Sigma 24 f/1.4 and the Sigma 35 f/1.4. My only gripes with another prime was the fact that the <50mm focal range on a full frame camera was uncharted territory for me. I was worried that the 35mm might have been to narrow and the 24mm too wide. I then found the Sigma 24-35 which took care of the uncertainty about focal range, the fact that the lens was capable of opening to a constant f/2 was the icing on the cake. The lens has been everything I could have dreamed from the tack-like sharpness to the great build quality and ergonomic feel. I would absolutely recommend this to anyone who might be looking for a wide zoom with prime-like capabilities. I'm excited for the future as Sigma keeps producing top-notch quality to their products that stray from the ordinary focal-length-molding that it's other manufacturers adhere by. Rated 4 out of 5 by Steve from Great street photography lens Ive now had this lens for about a month. I also have the sigma 24 1.4 and the canon 35 1.4. There is no question that the sigma 24 1.4 is amazing. I much prefer it to the canon 35 prime. However, it is nice to have the versatility of the sigma wide zoom. I photographerd a wedding event in natural indoor light, during the day, and it was wonderful to be able to quickly and effortlessly adjust from 24 to 35 without switching lenses. I tend to favor 24, but there is indeed a huge difference between a 24 and 35 image. For street photography im also impressed. I spent all day yesterday walking through the streets of lower Manhattan with this lens. Again, I prefer the 24 focal length, but for some more up close portraiture, the 35 was nice to switch to. Environmental portaiture versus a closer distance. There is some inevitable vignetting when you use this lens wide open, which to me is the only reason to get a 2.0 lens. This is much more pronounced at 24. Based on my research, vignetting would occur with just about any lens of this nature, and in most cases, the vignetting is nice, as it draws attention to the subject. For street shoots its nice, for some indoors or museums it can get annoying though. All of this is easily correctable in lightroom though. I am really impressed by the quality of the lens. Though not as sharp as the 24 1.4 prime, which is almost magical, it is still very sharp. The lens itself looks very sleek in a matted black finish, so much so that every time I'm out, people ask me if I'm a professional.Overall, I'm quite pleased. For low light and evening street photography, I would still probably go with a 1.4, but the versatility of a 2.0 zoom for day life is appealing. Rated 5 out of 5 by JLW from Love it Stunning image quality, superior optics and a bag of 3 primes all in one lens. What more could I ask for? Sharp wide open at f/2 with beautiful color rendering and fast autofocus for those who need it. My only complaint would be a tad too much vignetting for my liking, but that can be fixed with a click in Lightroom or PhotoShop. I prefer hefty lenses so the weight of this is far from a negative for me. This is my third Sigma lens (first in the Art series) and i'm continually impressed by the performance of this manufacturer. Rated 5 out of 5 by Joshua from Beautiful This is a beautiful lens to add to your arsenal. Perfectly wide and nice to have the flexibility to switch to 28mm or 35mm in the same lens. Not a huge difference but sometimes it's nice to change the perspective just a bit in a hurry without changing lenses. It's very fast and sharp. Rated 5 out of 5 by Robert P. from Excellent build quality and IQ, but heavy Build quality and IQ are both excellent. If money were no object, I would have the Sigma 35mm and Sigma 24mm instead. They are very slightly sharper, brighter (f1.4), and lighter (at least individually) I purchased this for about the price of one of those, so it is a great value. It's an odd one for sure, not a prime, but very short zoom range. Think of it as a replacement for two or three primes. If the weight of slightly over 2 lbs puts you off, save your time and don't buy it. Compared to the image quality of the Canon 16 to 35 mm, Which is better? Sigma 24-35mm F2 is capable of producing images comparable to fixed focal (Prime) lenses. If I were to this lens on an A6300 w/ speedbooster, what would the aperature become? f/1.4 and the field of view will be approximately the same as full frame because of the reverse crop factor. Is this a weather proof lens? 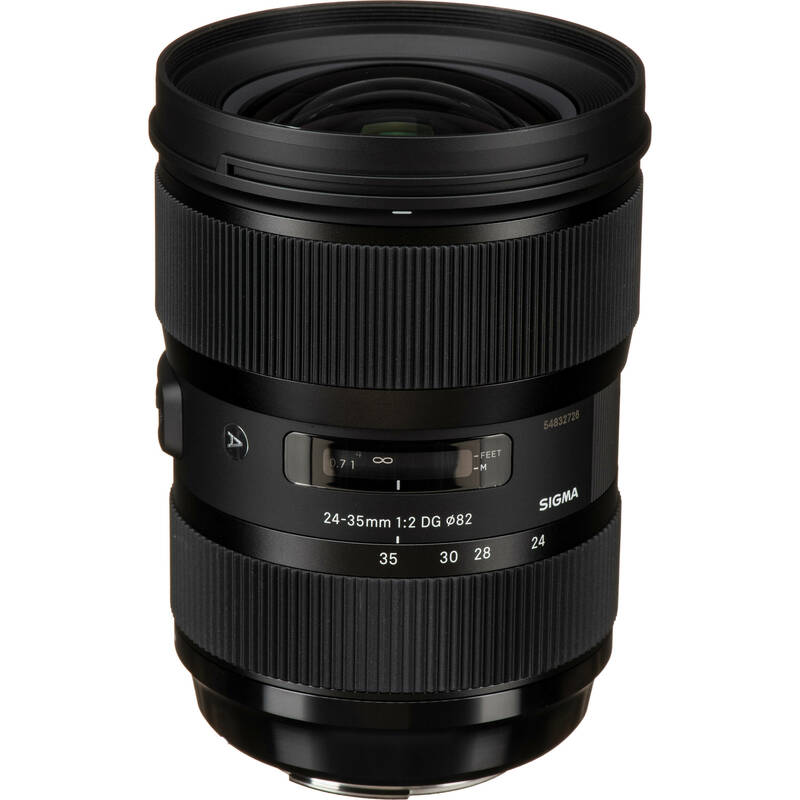 The Sigma 24-35mm f/2 is not weather sealed. Do the sigma art lens work with the Canon 5D mk4? Yes. I use it on my 5D mark IV all the time. Its amazing.